This article is sponsored by Best Buy, it in no way shapes my opinions in this post. By now many of you know that I bought my first home in January. Since then, I’ve been a busy girl doing all the home projects, gardening and of course, making my outdoor space perfect. I love to entertain and spend time outdoors with my family, so the patio area needs to be just as inviting and entertaining as my indoor spaces. That’s why I’m crushing hard on the new SunBriteTV Veranda Series. The SunBriteTV Veranda Series is the answer to all your outdoor home theater needs. I absolutely love this idea! It’s perfect for any family who likes to hang out on their patio and watch the game, round up the kids for movie night outside or just about anything you can think of that involves being outside with the TV on. The SunBriteTV Veranda Series will, hands down, enhance your outdoor lifestyle. Indoor TVs are not made to be outdoors. They can get damaged by weather, humidity, and dirt. The SunBriteTV Veranda Series is made for the outdoors, so you never have to worry about damage due to the elements. And, it comes it full-shade applications: Full Shade (Veranda), Partial Sun (Signature), and Full Sun (pro). So now you can keep up with the game from the pool! And you’ll never have to settle for staying indoors on a perfect day just to watch the game. It’s all about having the conveniences of the indoors outside when you want to enjoy a beautiful day. Engineered for permanent outdoor installation, the SunBriteTV is more durable, safer and offers higher performance than using an indoor TV outdoors. I absolutely love being outside. I spent a good bit of time making my outdoor space inviting and comfortable. Now, with the SunBriteTV Veranda Series, I’m excited to bring even more outdoors to make my space complete. Mounting a weatherproof TV outdoors is a new thing that is for the average person now with these TVs. I don’t have any outdoor patio but if you have one it would be perfect with SunBrite. The future is now, people! Having an outdoor TV would be amazing for our back deck. It’s covered and it seats quite a few people, so we could have some major game day festivities. This is such a beautiful setting for an outdoor TV comfort zone. I know you’re going to enjoy every moment of it. I remember when ceiling fans mounted on the ceiling of a covered porch/patio became popular. This would be great for a sports party, like the World Cup. Wow. A weatherproof tv! That would be so nice to have in our backyard patio. The boys can scream their hearts out during football season. It would also be nice to be able to relax on the patio and watch a movie with the hubby during summer nights. We have to get a Sunbrite TV! 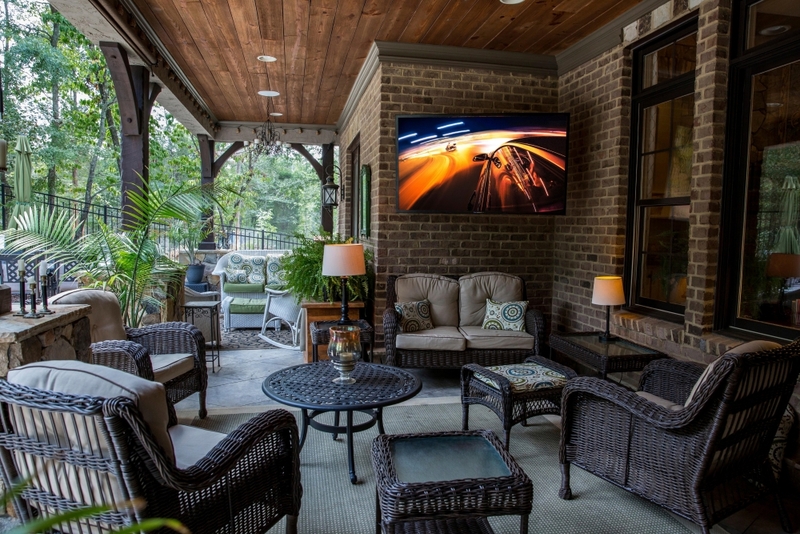 Having an outdoor tv would be a great addition to our deck. We could have weekend outdoor movie nights, or entertain guests for sporting events. I just saw this earlier today and I am super excited about weatherproof TV seriously. That is super sweet! I know I am in New England, so our colder winter season we won’t be outside enjoying it but it will be cool for the rest of the year! I would be so thrilled to have an outdoor television for entertaining. Snuggling under the stars with my hubby and a good show sounds like so much fun! We would love to have an outdoor deck someday! One of these tvs would be amazing to enjoy in our backyard with family and friends! This looks absolutely gorgeous!! I wish I can have a lovely veranda like this! I want to revamp my outdoor patio. People take for granted how fun outdoor entertaining can be! We are big baseball and hockey fans, so having this television to entertain and be outdoors during the games would be great. I would also make family movie night more interesting. Coming from Florida, humidity is the worst. This is perfect! Having high tech outdoors just makes sense. Folks are entertaining on patios and decks! It’s a must! And smart!